Hello, friends. Since time for longer writing has been scarce, I realize you haven’t heard from me for some time. I have some musings in the works on Sovereignty, and the lessons of Gaul. For now, a few updates on what I’ve been up to and what’s coming. During the last few quiet months, I’ve been busy with a new mandate from the Queen: Gathering Her priesthood. I have brought together a small group of folks who share the faculty of having been chosen by the Morrigan or dedicated to Her service. We are gathering, presently under the name Coru Cathubodua, and marshaling our skills and resources for Her service. For the last few months and through this summer we will be continuing to develop our ritual practice privately. Beginning this fall near Samhain, we will be coming forth to serve the community through public ritual and other offerings. You can look for a Samhain ritual to be offered in service to the Queen and the Dead, somewhere in the Bay Area; and we’ll plan on sharing something at next year’s PantheaCon in February as well. Also this fall, I’ve been invited to teach and bring a Morrigan devotional ritual to the Western Gate Samhain Festival, in Kelowna, BC, Canada. I am excited to be joining Brendan Myers, Sarah Lawless and other fine practitioners at this gathering, including our own Amelia Hogan and other members of the Coru. Along the route, we’re looking at arranging stops in Portland and Seattle, where you may be able to catch a performance of Amelia‘s exquisite Celtic song, and meet or attend a workshop with us. For now, the only details set are the Western Gate dates of October 19-21 in Kelowna. I’ll post more details as we settle them. On the personal level, I’ve been undergoing seismic changes in my private life, reflected in my devotional practice. I’ve taken up fighter training and am currently studying spear/glaive fighting in the SCA, along with Krav Maga. 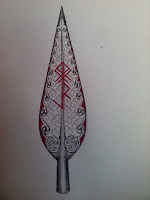 I’ve been very drawn to the Spear, as one of the Four Weapons of the Tuatha, and have long used it spiritually. It’s deeply fulfilling to be learning now how to wield it in the body. And not only for fighting: after my last devotional dance performance at Hexenfest, I received an inspiration to develop a devotional dance with the spear as well. So now both dance and combat movements with the spear are part of my daily practice. I expect to have something ready to perform by next year’s Hexenfest, if not earlier. 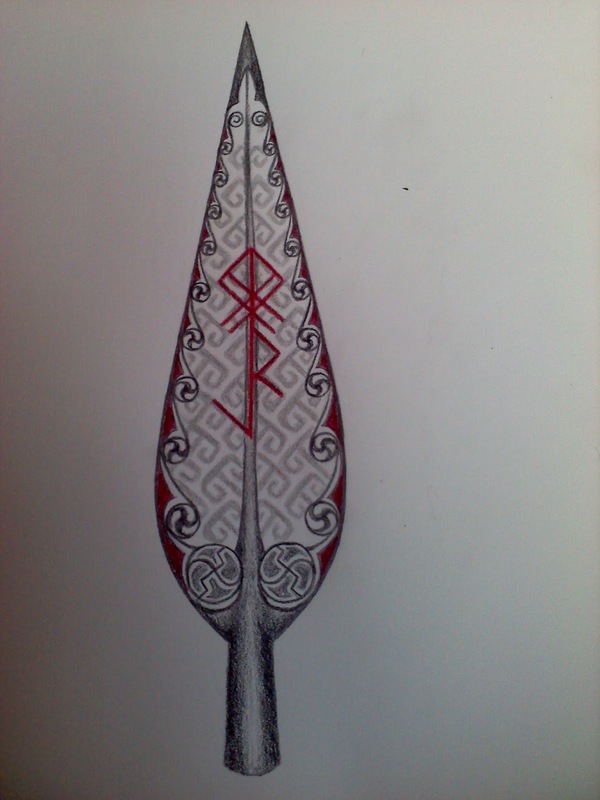 Oh, and I had the Morrigan’s Spear tattooed on my back. That’s been a long time coming. Progress on the Morrigan statue continues slowly. My relocation away from Stone City interrupted the scheduled Devotional Days when we had planned to make it available for folks to assist with it, so as a consequence work on the statue has mainly been within the priesthood group. I hope to have another work session on that soon and new photos to post. That’s all for today. May your days be full of honor and joy, and I’ll write more soon.